If you go back and read the context of this verse [as you always should], you will see this is about the time that Joshua and Israel came to the border of the Promised Land. They had just camped by the border of the Jordan River. On the other side was the Promised Land - a land with all the good things they had dreamed about. Christ was raised from the dead on the third day. The third day is then the day of resurrection, the day of new life, the day of fulfilled promise. So here is Israel, on the third day, looking with longing at the Promised Land. The first two days had been days of waiting, hoping, believing and dreaming. Now it was the time to reach what God had given them. However, there was a problem. The Jordan River was in flood. No matter what the size of the Jordan River is today, thousands of years ago it was a major obstacle…and in flood season it was an impossible obstacle. Yes, a couple of men, like the two spies, could find a way across but moving a full army along with women, children [probably 3 million + people], animals and possessions - not going to happen in the natural. Are you praying and believing God for a miracle? Is there an impassible Jordan River in your life keeping you from the promises of God for you and your family? Your “Third Day” is coming! It is important to realize that “Third Day” experiences do not usually happen automatically. Consider the situation of Israel. God had promised them the land of Canaan. It was theirs by the Word of the Lord. But someone else lived there. Vicious giants roamed the land. Some of the most perverted people in the history of the world lived there. Mighty walled cities were there. Experienced armies with iron chariots patrolled the country - and everyone in ancient times knew an infantry does not beat mounted regiments. It was these threats that motivated the first generation of Israelites to quake in fear. The new generation had the faith to face these challenges. They knew the land was theirs on promise. But they also knew that they would have to believe the promise enough to go in, fight against all odds and stand their ground against counter-attack. The greater the promise, the greater the struggle. That is why we are given instructions like: Be courageous, faint not, persevere to the end… And today evil is rising is ugly head around the world and striking at the Church, but the Church triumphant will remain. Whether you are part of the “first generation” that runs in fear or the “second generation” that is ready to war for the promises of God is up to you. But before Israel could get into the land and begin fighting in submission to God and His leadership to possess what God had promised them, they had to get across the Jordan River. They were excited and ready to go, but they were being held back. Why? There were three [at least] lessons they needed to learn and that would be essential to conquering the Promised Land and enjoying the blessing of God. 1. They had to learn to trust God for themselves. For the last forty years they had lived in a very “socialist” environment with God supplying all their needs with very little effort on their part. But it is only very small children and very sick people who need that kind of environment. The “first generation” were both. It had been a time of seeing God’s unearned provision. Now that type of provision was about to come to an end. Now it was time take responsibility. But this was not independent action. Independent action could not cross the Jordan or successfully fight the battles ahead. This was the time for a whole new level of trust. Trust that as they stood and fought according to the will and promises of God, God would fight with them and overwhelming odds would be defeated. The Jordan River was the first step in that trust - would they believe that God could get them across? 2. They also had to learn or show that they had learned obedience. Sitting on their “behinds” wasn’t going to do it. They had to get up and move forward. But not on their own initiative or timetable. The “first generation” had tried that. After refusing to go into the Promised Land because of fear they changed their minds and charged in in presumption. Defeat was the only possible outcome. This “second generation” had to be obedient. They had to move forward when trusted Godly leaders told them too. They had to be willing to look like fools marching toward a flooding Jordan River because that’s what God had told them to do. In these days we need the Spirit of Discernment. There are so many voices in the “Christian” community crying different things. “Christian” leaders who are really false prophets leading people to destruction rather than victory. Jesus said His sheep would know His voice. But the only way His sheep are going to know His voice among all the clatter out there is by spending time with Him in Bible study and prayer. We are responsible to know the voice of Jesus for ourselves and find Godly leaders that we can submit to. If we can’t find Godly leaders to help us across the Jordan, we won’t have anyone to fight under in the Promised Land. Leaders that are confused on basic issues like the authority of the Bible, abortion and sexual perversion are false leaders. Leaders who compromise the validity of God’s Word in the first 11 chapters of Genesis are deceived, ignorant or suspicious. Leaders who are not balanced in their teaching or who overemphasize minor things and downplay or ignore major things are dangerous. 3. Ultimately, who or what did they follow across the Jordan? Godly leaders? No. 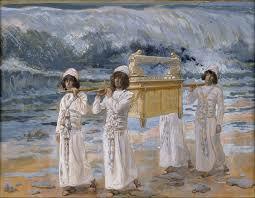 They followed the Ark of the Covenant. What was the Ark of the Covenant? The Ark of the Covenant contained the legal document summary of the covenant between them and God. We know this summary as the Ten Commandments. On top of the Ark was the Mercy Seat. Israel could not perfectly keep the Law of God - no one can. The Mercy Seat, and the blood shed there, looked forward to the time when Christ would shed His own blood to forgive the sins of His people and bring them into intimate relationship with God. This is important. The Mercy Seat did not do away with the Law. The Law was [and still is] God’s perfect standard. It does not change. It will never change for God will never change. As Christians the Mercy Seat [blood of Christ] removes the judgment and condemnation of the Law. However, we have been given a new heart. We should want to keep the Law. We should be working on learning and applying the Law in our lives and in our world. The Israelites followed the Law-Covenant across the Jordan and into the Promised Land. Independence was not going to cut it. Living however they felt like was “first generation” thinking that had to be discarded. They had to make a sustained, conscious effort to live in obedience to the Word of God. The Mercy Seat was there to cover their imperfections but they had to be serious and moving forward. It was only as they ordered their lives according the Law that they experienced success and inherited the promises. The “first generation” - if they could be called true believers - wasted their lives in the wilderness and missed God’s blessing.